Actin-activated MgATPase activity is measured using an NADH-coupled assay in a Beckman DU 640 spectrophotometer. Blebbistatin [a racemic mixture of the (+) and (-) enantiomers] is added from stocks dissolved in DMSO and the DMSO concentration is maintained at a constant concentration of 5% in all samples. Blebbistatin effectively inhibited actin-myosin interaction in mouse cardiac muscle through a mechanism independent on Ca2+ influx and activation systems. 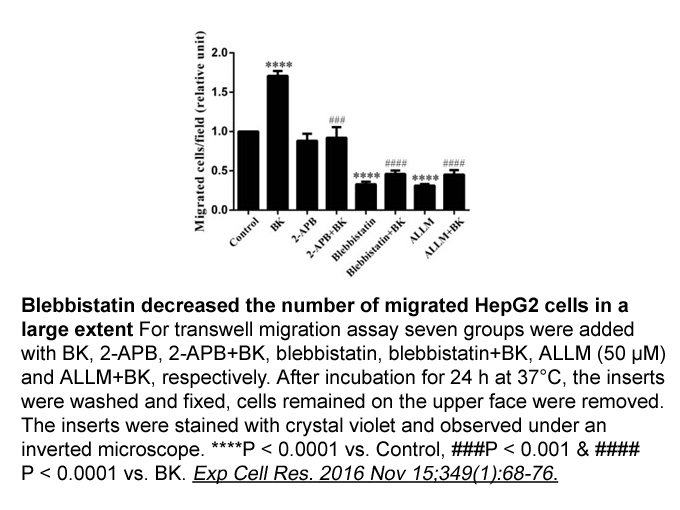 In addition, blebbistatin prevented thrombin-mediated inhibition of intercellular calcium wave propagation in bovine corneal endothelial cells. Blebbistatin treatment induced zebrafish embryos cardia bifida in a dose-dependent manner. 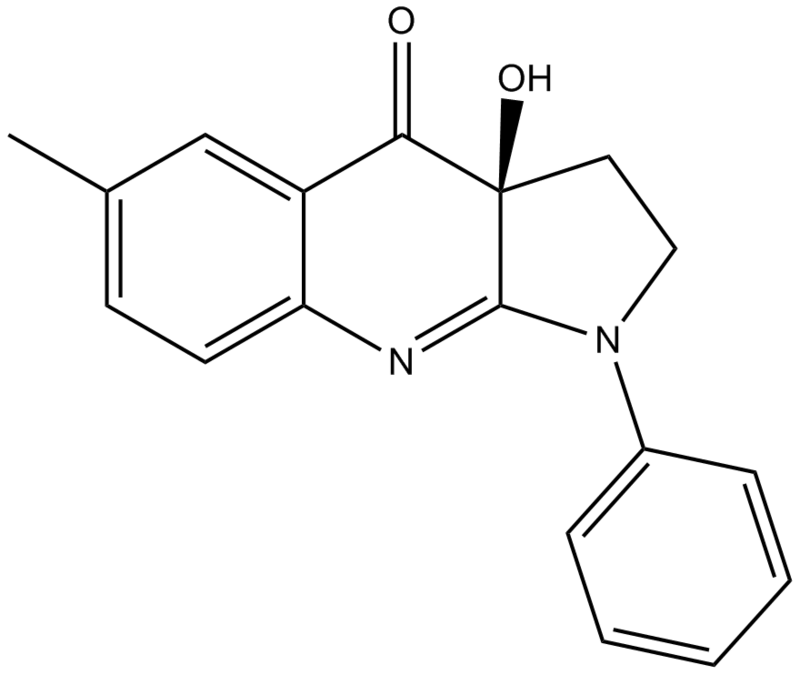 (-)-Blebbistatin is a cell-permeable non-muscle myosin II ATPases inhibitor with an IC50 range of 2 μM [1,2]. Non-muscle myosin II (NM II), an actin-binding protein, plays a central role in regulation of cell migration, adhesion and differentiation . Recent insight into the importance of NM II in these processes has been highlighted by genetic deletion and mutation methods that discovered NM II mutations affect the function of a wide range of proteins and cause monogenic diseases [5.6]. (-)-Blebbistatin is a small molecule inhibitor and preferentially binds to the myosin-ADP-Pi complex to slow down phosphate release . The inhibitor completely eliminate contraction of activity of actin-activated Mg-ATPase and motility of myosins II for several species in vitro (IC50 = 0.5-5.0 μM) [8,9], but it has poor effects on smooth muscle myosin II (IC50 =80 μM) and myosins I,V, and X . Furthermore, blebbistatin can potently inhibit mammalian arterial smooth muscle (IC50=5 μM) . 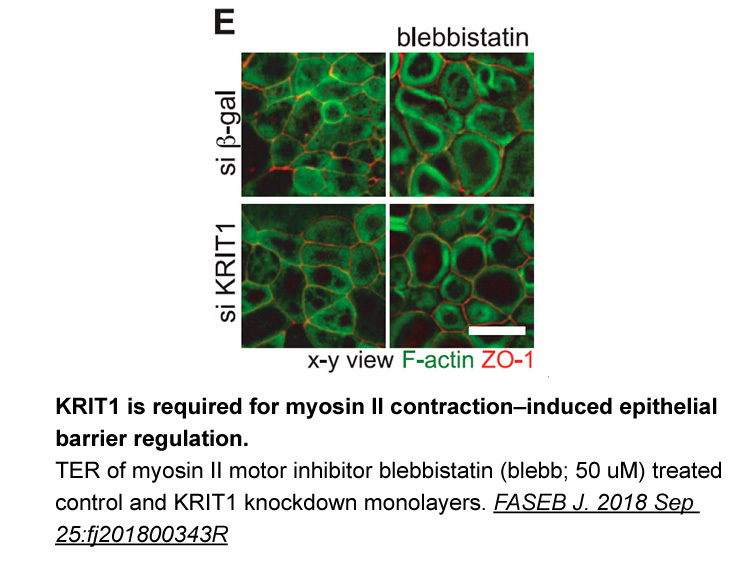 The property that blebbistatin blocks myosin II in an actin-detached state and prevents rigid actomyosin cross-linking is a great advantage in vivo applications [2,11]. In a constant-pressure grant perfusion model system, the CB and TM cells were treated with blebbistatin (10-200 M) and cell morphology was changed, and actin stress fiber content decreased. The blebbistatin effect was completely reversible by washout within 24 hours . Blebbistatin inhibited single cellular contraction without altering the morphologies of intracellular calcium transients (IC50 = 0.43 μM). Exposure to UV light at wavelengths below 488 nm can also cause blebbistatin rapidly suppressed. .
. Straight AF, Cheung A, Limouze J, et al. Dissecting temporal and spatial control of cytokinesis with a myosin II Inhibitor. Science, 2003, 299:1743–1747.
. Kovacs M, Toth J, Hetenyi C, Malnasi-Csizmadia A, Sellers JR. Mechanism of blebbistatin inhibition of myosin II. J Biol Chem, 2004, 279:35557–35563.
. Limouze J, Straight AF, Mitchison T, Sellers JR. Specificity of blebbistatin, an inhibitor of myosin II. J Muscle Res Cell Motil, 2004, 25:337–341.
. Miguel Vicente-Manzanares, Xuefei Ma, Robert S. Adelstein,Alan Rick Horwitz. Non-muscle myosin II takes centre stage in cell adhesion and migration.Nat Rev Mol Cell Biol, 2009 Nov, 10(11): 778–790.
. Burt RA, Joseph JE, Milliken S, Collinge JE, Kile BT. Description of a novel mutation leading to MYH9-related disease. Thrombosis Research, 2008, 122(6): 861-863.
. Butcher DT, Alliston T, Weaver VM. A tense situation: forcing tumour progression. Nature Reviews Cancer, 2009 Feb, 9(2):108-122.
. Chen Y, Boukour S, Milloud R, Favier R, Saposnik B, Schlegel N, et al. The abnormal proplatelet formation in MYH9-related macrothrombocytopenia results from an increased actomyosin contractility and is rescued by myosin IIA inhibition. Journal of thrombosis and haemostasis : JTH , 2013, 11:2163-2175.
. Fedorov VV, Lozinsky IT, Sosunov EA, Anyukhovsky EP, Rosen MR, Balke CW, et al. Application of blebbistatin as an excitation-contraction uncoupler for electrophysiologic study of rat and rabbit hearts. Heart rhythm: the official journal of the Heart Rhythm Society, 2007, 4:619-626.
. Zhang X-h, Aydin M, Kuppam D, Melman A, DiSanto ME. 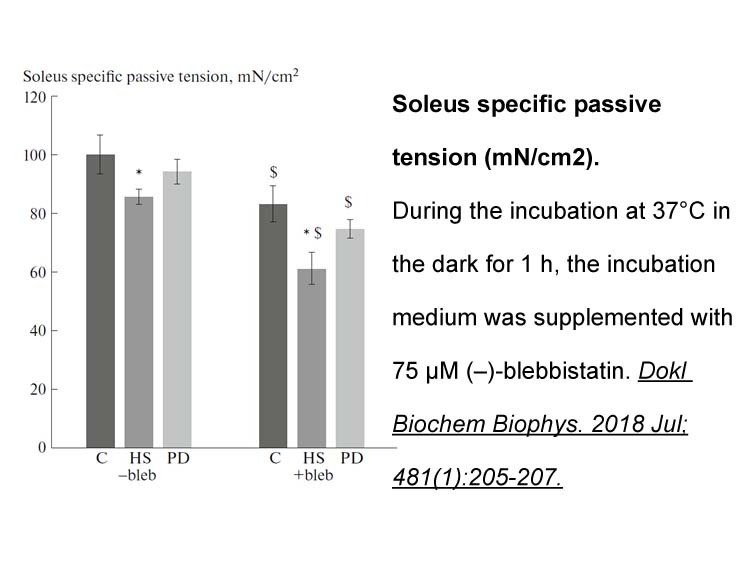 In Vitro and In Vivo Relaxation of Corpus Cavernosum Smooth Muscle by the Selective Myosin II Inhibitor, Blebbistatin. The Journal of Sexual Medicine, 2009, 6:2661-2671.
. Zhang M, Rao PV. Blebbistatin, a novel inhibitor of myosin II ATPase activity, increases aqueous humor outflow facility in perfused enucleated porcine eyes. Investigative ophthalmology & visual science, 2005, 46:4130-4138.
. Lucas-Lopez C, Allingham JS, Lebl T, Lawson CP, Brenk R, Sellers JR, et al. The small molecule tool (S)-(-)-blebbistatin: novel insights of relevance to myosin inhibitor design. Organic & biomolecular chemistry, 2008, 6:2076-2084.